Yes... YES! I knew somebody would come. CACKLEHACKCACKLECOUGH! My name is Amber and these are my screenies. I started doing screenies maybe a year ago. When my previous computer crashed, I lost all of them. Oh, how I mourn their passing. Now I simply have a handful. I don't capture the moments everyone does. In hopes of making them unique, I have only a few. Please look through them and tell me what you think! I would love to have your feedback! But please note that I won't screenie you if you beg. What's the point in that, really? 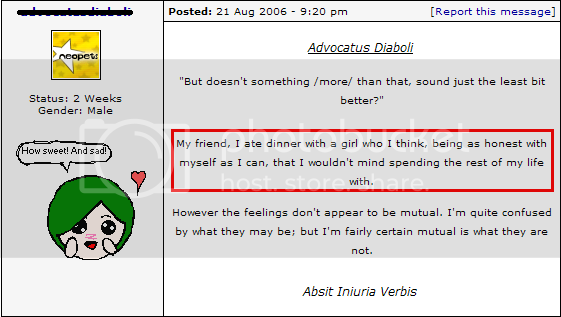 11.26.06. Started screensite and added first batch. 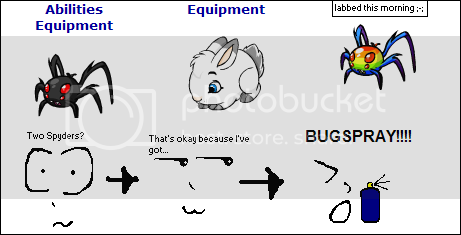 It's screenies like these with such horrible drawings that make me think maybe I shouldn't draw on them. 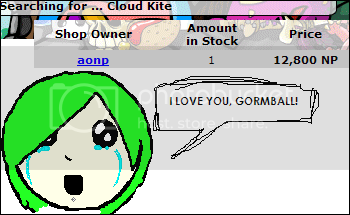 This is me looking up an item gotten from Gormball. I've since gotten 1k more. 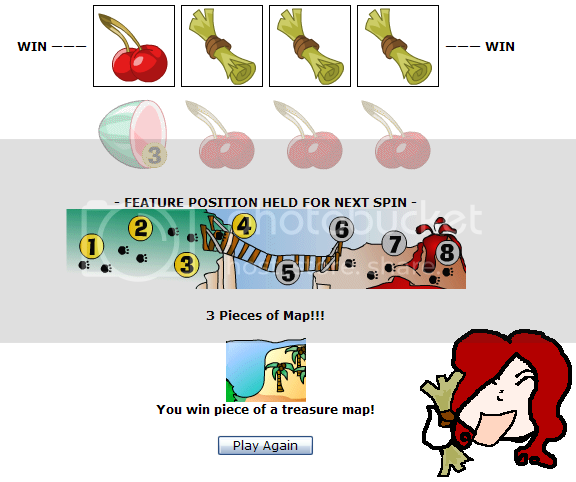 I'm not very lucky with that game. 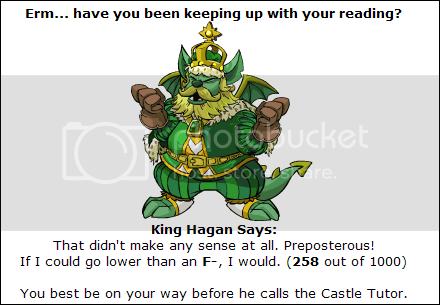 The first sign of him again caused me to panic at the loss of my Fire PetPet Paint Brush. 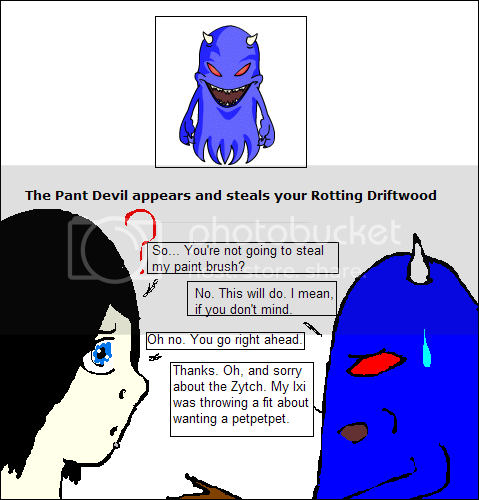 He just wanted a piece of wood. 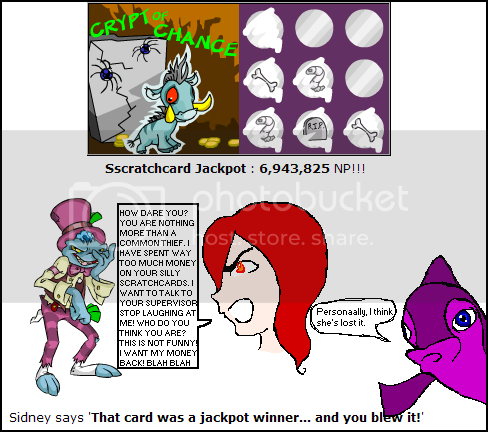 I never win anything on Neopets! This made me SO happy! 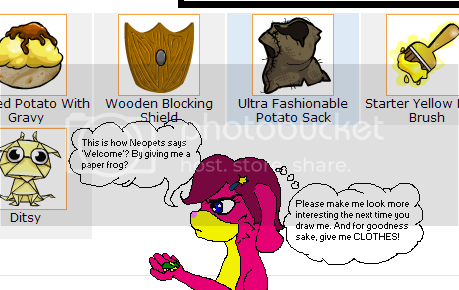 My neopets are slowly building an army of Spyders. There's no cute little drawing for this one. I've just never gotten this reaction. I used the SSW to search for an item for a quest I was doing. The other items were too expensive, but I had to grab this find . I got this on my side account in 2 days of existance. I don't have it on this account in 4 years. Most. Useless. Random Event. EVER! Can you tell that this is my first plot-related trophy? 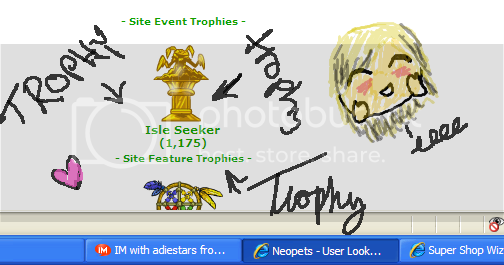 Over 4 years on this account, and that's my first plot trophy. u.u;; I look like some blond and tanned nut. ;x I'm just getting used to PSP (I have 5 more days left on my trial... Eh. ), so the colors are all weird. My hair used to be black, but Im growing it out and it's blond underneath. And I'm not really that horribly, orange tanned. I'm pale. I was just too frustrated to fix it. I did a job for the Faerieland Agency. I THOUGHT that it said I had to get 21 tan blushes. When I hit around 14, I went back to check. Oops. I only needed 6. True, it wasn't a spectacular reward, but GEEZ! The quests have been CHEAP for me today. 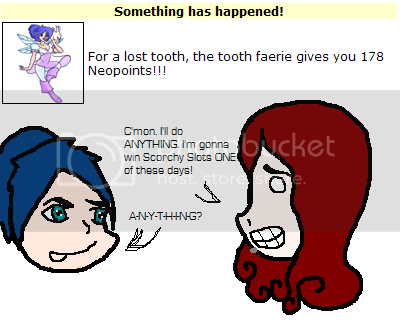 I spent only a little over 1k for Taelia and got back at least 3k, and now Edna only made me spend 99 NP? 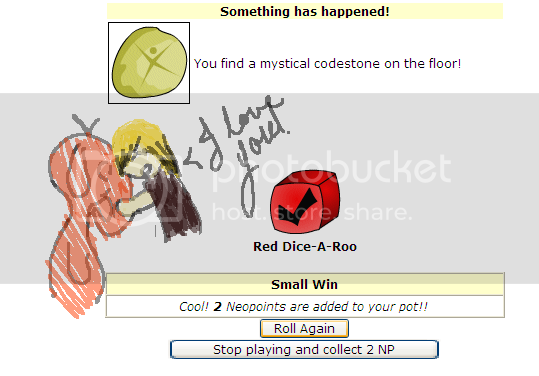 I hope this luck continues! 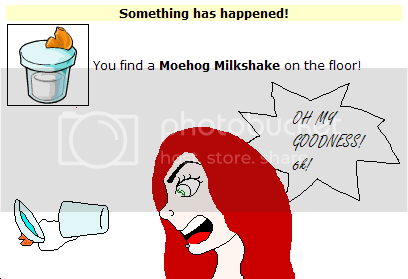 Well, maybe if she noticed me, SOMETHING WOULD HAPPEN! 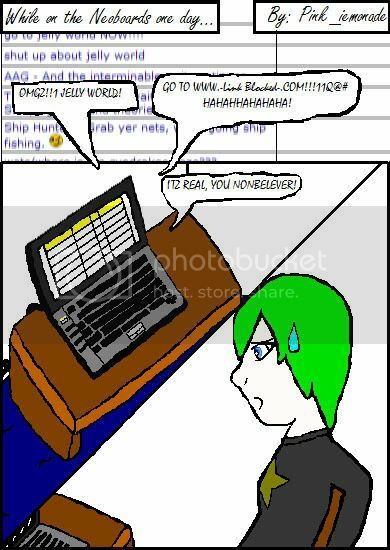 I hate REs that don't do anything. UGH! Would it hurt him to just let me win once? This is Miss Uhrie on my new side account. She...wasn't very impressed with the newbie pack. :3 Yay for finding things on the ground! 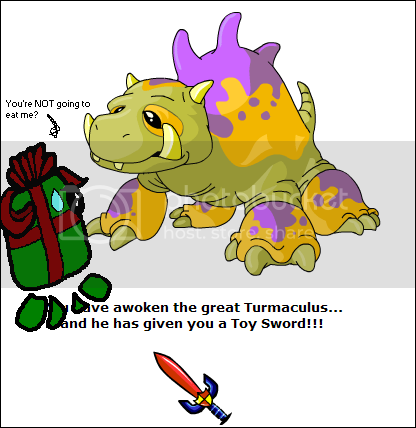 I MAY be a vegetarian, but I didn't want to upset Turmy. Ahem. Yeah. An account I haven't used in over a year. PSHT. I WAS saving up for a lab map for my side account nerdly, but it was taking too long. 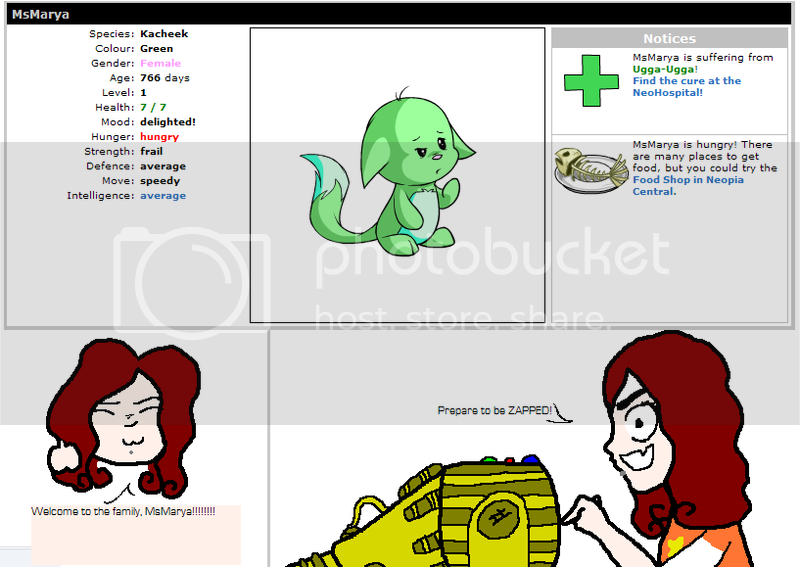 I decided to zap pets from the pound. Weee! 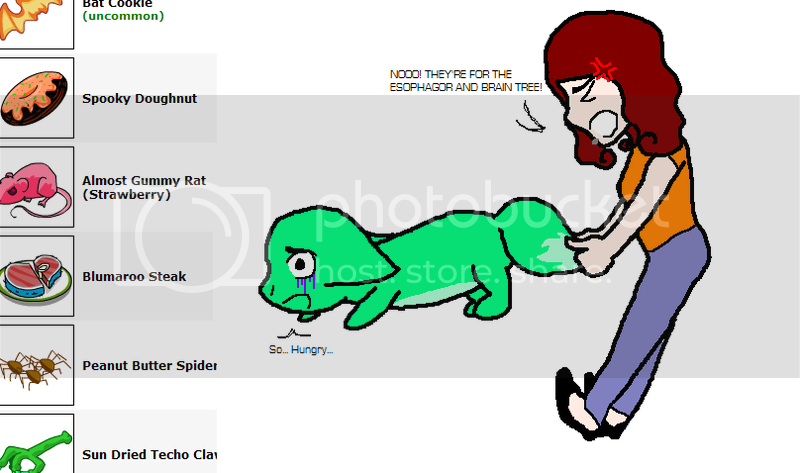 D: I have to SAVE that food! A short comic I submitted about the boards. I don't know why it wasn't accepted. Perhaps because of the computer. Perhaps because of the font. I still like it and will, therefore, post it for your enjoyment!